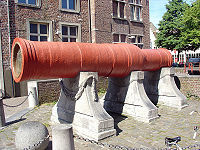 Stone balls: Cannon of extraordinary bore, which fired stone balls, were first introduced at the turn of the 14th to 15th century in Western Europe. 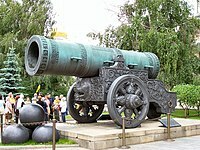 Following a logic of increasing performance through size, they had evolved from small handguns to giant wrought-iron or cast-bronze bombards within a span of just several decades. 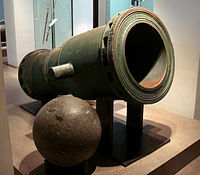 Iron balls and shot: By the 16th century, however, a general switch from stone balls to smaller, but much more effective iron projectiles was in full swing. 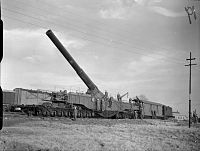 This and the parallel tendency towards standardized, rapid-firing cannon made the enormously costly and logistically demanding superguns soon obsolete in the European theatre (with the exception of the odd showpiece). 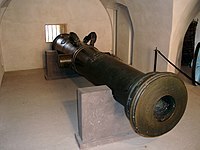 Explosive shells: In the Industrial Age, artillery was again revolutionized by the introduction of explosive shells, beginning with the Paixhans guns. 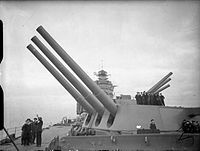 Breakthroughs in metallurgy and modes of production were followed up by new experimentation with super-sized caliber weapons, culminating in the steel colossi of the two World Wars. 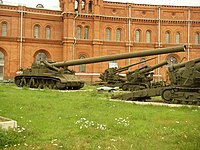 In the post-war era, the development of extremely overpowered artillery was gradually abandoned in favour of missile technology, while heavy guns are still demanded by various arms of the service. 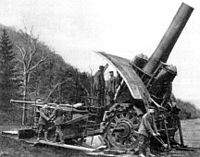 As artillery pieces of the different periods, due to the dissimilar characteristics of their projectiles, are practically incommensurable in terms of their bore size, the following list is split into three sections. 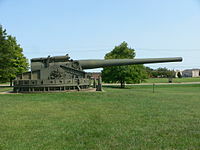 Twenty-inch (508 mm) Rodman and Dahlgren smoothbore cannons were cast in 1864 during the American Civil War. The Rodmans were used as seacoast defense. 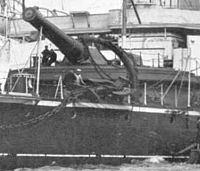 Although not used as intended, 2-20" Dahlgrens were intended to be mounted in the turrets of USS Dictator and USS Puritan. 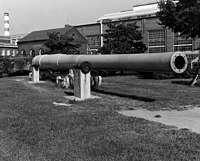 406 16"/50 caliber Mark 7 gun for the Iowa-class battleships Naval gun 1943 United States Washington Navy Yard, Washington, D.C.
^ The bombard has a conical bore of 82.5–90 cm. 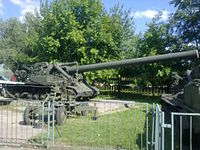 ^ The bombard has a conical bore of 76–88 cm. ^ Bown indicates a larger bore of 36 in (914 mm), but Hollenback says that Kritoboulos, a contemporary source, indicates a circumference of 12 spans and concludes that in this case the smallest of three possible sizes of span is the correct unit, giving 0.745 m for the bore. 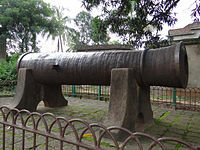 Hollenback also notes that granite cannonballs dating from the siege of Constantinople had a diameter of 0.711 and could have been shot from this weapon using a wooden sabot. 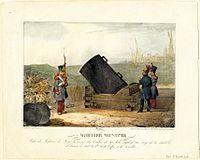 ^ The bombard has a conical bore of 67–80 cm. 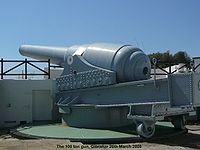 ^ The bombard has a conical bore of 45–58 cm. ^ Schmidtchen 1977a, p. 162; ball diameter is 20 mm less (p. 171, Fn. 41). ^ Stephen R. Bown (2005). A Most Damnable Invention: Dynamite, Nitrates, and the Making of the Modern World. Penguin Group. ISBN 0-670-04524-1. ^ Schmidtchen 1977b, p. 222; ball diameter is 20 mm less (p. 171, Fn. 41). ^ Schmidtchen 1977a, p. 164; ball diameter is 20 mm less (p. 171, Fn. 41). ^ Schmidtchen 1977b, p. 218; ball diameter is 20 mm less (p. 171, Fn. 41). ^ Schmidtchen 1977a, p. 166; ball diameter is 20 mm less (p. 171, Fn. 41). ^ Dasgupta 2009, p. 55. This page was last edited on 22 February 2019, at 19:54 (UTC).